A loving breed, the Chesapeake Bay Retriever has slightly webbed toes and a gentle jaw to help retrieve ducks from icy waters. The Chesapeake Bay Retriever, or “Chessie,” has a broad, round skull that tapers to a medium stop and strong jaws capable of carrying large game birds. These dogs are strong and powerful with a medium build and a deep chest. They have wide-set eyes that range in color from yellowish to amber. Their ears are set high on their heads and hang loosely. The Chesapeake has a short, dense coat that contains natural oils to help the dogs repel icy waters in which they often perform their duties. The coat also allows the Chesapeake to dry quickly. It ranges in colors such as brown, red, sedge or tan in the shade of dead grass. Their tails are medium length with a thicker base. The dogs have webbed toes that aid in swimming. They have been bred to carry waterfowl without damaging them, and when trained properly, these dogs can even carry an egg without cracking it. 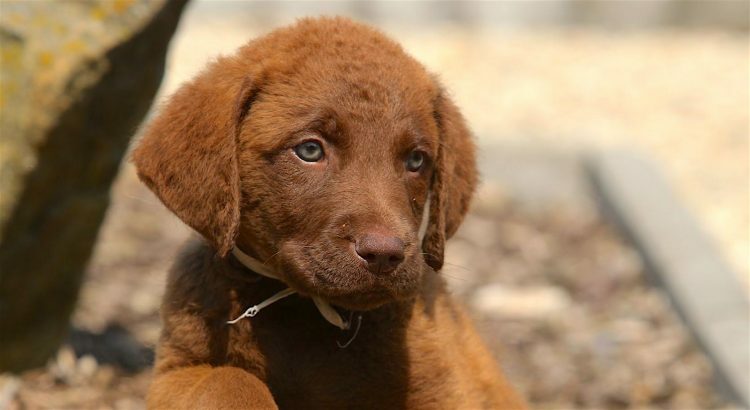 The Chesapeake Bay Retriever originated in 1807, when a pair of Newfoundlands were found in an English shipwreck off the coast of Maryland, near Chesapeake Bay. Those 2 dogs went on to breed with local retrievers, including English Otterhounds, Flat-Coated Retrievers and Curly-Coated Retrievers. 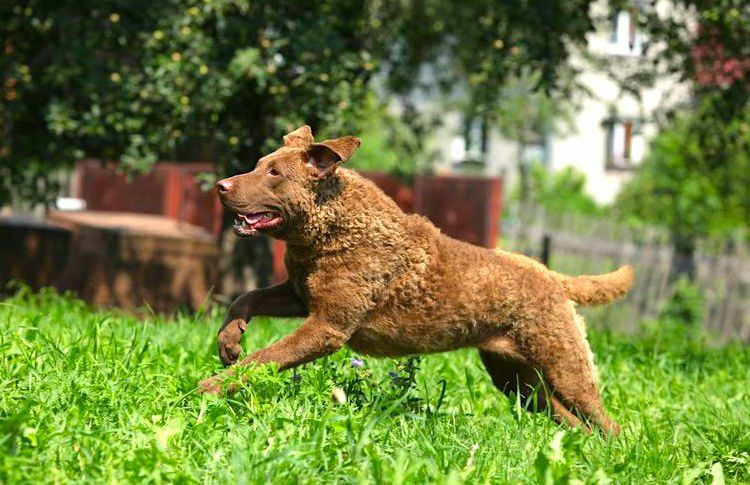 Continued and careful breeding over the years resulted in the Chesapeake Bay Retriever. These dogs were and are used for hunting waterfowl in the often frigid Chesapeake Bay waters. They help collect hundreds of waterfowl a day. The breed was recognized by the American Kennel Club (AKC) in 1878. 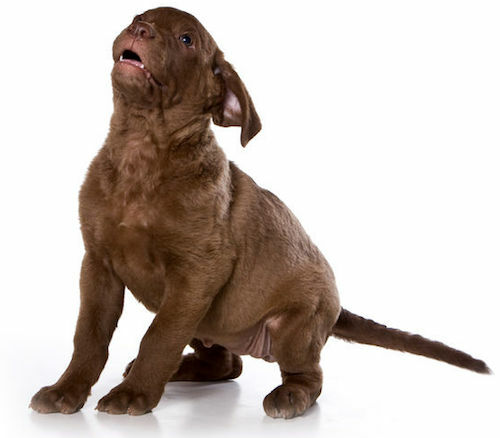 The Chesapeake Bay Retriever is an intelligent, affectionate and courageous dog. They are willing to please their trainers, although sometimes they can take longer to train, thanks to being naturally dominant dogs. Inexperienced at caring for a dog? You might want to avoid this breed. The Chesapeake can turn stubborn and willful if you’re not firm, patient and consistent in training. Chessies are good with children and have a loving nature. They usually get along with cats, but don’t be surprised if they chase unfamiliar cats. HIGH: The Chesapeake needs a great deal of stimulation and exercise. They especially love water sports but are also satisfied with a long jog or run. Exercise your Chessie daily — otherwise, they may misbehave out of boredom and unused energy. LOW: The Chesapeake is an average shedder, and the short coat makes for easy grooming. Use a firm-bristle brush to remove loose hairs. Bathe your Chessie occasionally, but not so much that you remove the natural oils in the coat. This Chessie puppy wants to sleep — but can he? Many purebred and mixed-breed Chesapeake Bay Retrievers are available in the United States, so check shelters and rescues first. You could start your search now over at our Pet Adoption Center. If you go through breeders, get to know them and make sure they’re not running a puppy mill. Get documentation of your retriever’s parentage and health histories from the breeder. Although the Chessie has relatively few health issues, they can crop up. A responsible breeder has this information on hand.